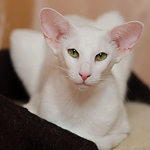 Expected colors of Siamese and Oriental kittens: white. Males: chocolate and lilac, ebony(?) and blue(? ), red and cream; females: chocolate-tortie and lilac-tortie, black-tortie(?) and blue-tortie(? ), red and cream. Both, tabby and solid colors.